stationary over the equator at 114° West longitude. This location permitted television transmissions to remote regions of both Canada and Alaska. The mass of the CTS spacecraft was 676 kg at lift-off, of which approximately 340 kg was in the weight of a rocket motor, called the apogee boost motor, required for an orbit maneuver during the acquisition phase. As shown in Fig. 1-2, the spacecraft is approximately cylindrical, 1.88 m high and 1.83 m in diameter. The main operating power is supplied by two extendable solar arrays, each 6.20 m long and 1.30 m wide, with a mass of 15 kg and a power output of 600 watts per array. CTS has a total of 11 attitude sensors*: 4 used exclusively during the acquisition phase when the spacecraft was spin stabilized, 2 used during the operations phase when the spacecraft was three-axis stabilized, and 5 used for the transition from spinning to nonspinning. In addition to the large apogee boost motor used during the acquisition phase, the spacecraft includes 18 small rocket motors (2 "high thrust" and 16"low thrust") for orbit and attitude maneuvers. *In addition to the 11 sensors, 3 gyroscopes were used to sense the rate of change of the attitude. altitude of 35,860 km. 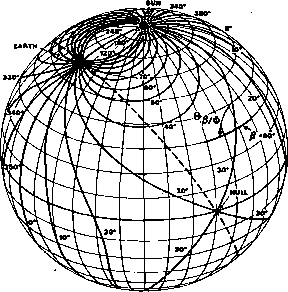 (See Chapter 3 for a general discussion of orbits and orbit terminology.) Before injection, which marked the end of the launch phase, the spacecraft was controlled by the launch control team at the launch site. Subsequent to injection, the acquisition phase began and control of the spacecraft was transferred to the Operations Control Center at NASA's Goddard Space Flight Center in Greenbelt, Maiyland. 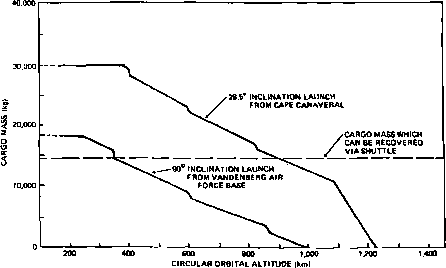 The purposes of the transfer orbit were to move the spacecraft to synchronous altitude so that the large apogee boost motor could be fired to change the orbit to an approximately circular, synchronous one, as shown in Fig. 1-3, and to control the timing of this apogee motor firing. The smaller motors could then be used for various orbit and attitude refinements. Because the apogee motor was fixed in the spacecraft, it was necessary to reorient the entire spacecraft such that the motor firing would provide the proper orbit change. Thus, the principal activity during the transfer orbit was to determine the attitude, test and calibrate (if needed) the attitude sensors, reorient the spacecraft to the proper apogee motor firing attitude, and make fine adjustments and measurements as needed to ensure that the proper attitude had been obtained. To carry out this sequence and to provide for proper positioning in the synchronous orbit, the spacecraft remained in the transfer orbit for 6-1 /2 orbits, or about 3 days. While in the transfer orbit, the spacecraft was spin stabilized at approximately 60 rpm. Two Sun sensors and two Earth horizon sensors were used for attitude determination with an accuracy requirement of I deg for apogee motor firing. The two high-thrust rocket motors were used to reorient the spacecraft spin axis by about 225 deg from its initial orientation (as it left the third stage of the launch vehicle) to the apogee motor firing attitude. A maneuver of more than 180 deg was required to avoid lowering perigee (the minimum altitude point) in the transfer orbit due to the translational thrust of the maneuver jets. The apogee motor firing changed the orbit to nearly circular and changed the period to approximately 23 hours 15 minutes so that the spacecraft would drift slowly westward relative to the Earth's surface. A series Of orbit adjustments made the period nearly identical with the Earth's rotation period when the spacecraft was over the desired longitude. During this. 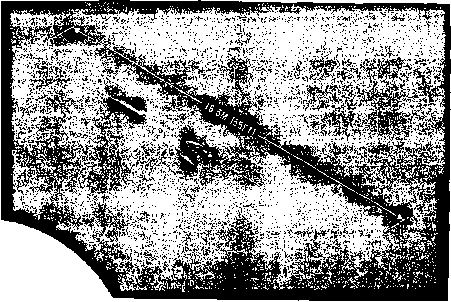 station acquisition phase, the principal attitude requirement was to bring the attitude to orbit normal (i.e., perpendicular to the orbit plane) after the apogee motor firing and to maintain it there for orbit maneuvering using the two high-thrust jets. The station acquisition sequence required a total of five progressively smaller orbit maneuvers carried out over a period of 9 days after apogee motor firing. After station acquisition, control of the spacecraft was transferred to the Canadian Research Council, which conducted a major attitude maneuver sequence to transform the spacecraft from a spin-stabilized mode to a three-axis-stabilized, Earth-pointing mode [Bassett, 1976]. This was the most complex attitude maneuver conducted during the mission and consisted of a 2-day sequence of operations divided into 39 specific events. During this phase, attitude determination input was changed from the four sensors previously mentioned to five Sun sensors and two Earth sensors designed for use during the acquisition phase. The set of 16 low-thrust jets was used to despin the spacecraft and to control it in the nonspin-ning mode. Additional control was supplied by a spinning flywheel, which was used to reorient the spacecraft about the wheel axis by changing the relative angular momentum of the wheel and the spacecraft body. The major-events in the maneuver sequence were: despin of the spacecraft, maneuver of the spacecraft to bring the Sun to its desired position in the control system field of view, deployment of the solar arrays, spinup of the flywheel, rotation of the spacecraft about the line to the Sun to orient the flywheel axis perpendicular to the orbit plane, and a series of rotations to achieve the final three-axis attitude with the Earth in the center of the Earth sensor field of view. Completion of the attitude maneuvers ended the acquisition phase of the mission. After further hardware checks, normal mission operations were initiated. During the planned 2-year life of the spacecraft, the attitude control system will be used to maintain the attitude within 0.1 deg of its nominal orientation. The major factor in mission lifetime is the consumption of fuel for attitude stabilization, although orbit drift, possible mechanical failure, and power loss due to radiation damage to the solar cells may also affect the useful life of CTS. * For an extended discussion of long-term space developments, see the Future Space Programs report of the 94th Congress  and the NASA Outlook for Space series [1976a, 1976b]. allow heavier and more extensive hardware than previously used. The potential cargo mass for various shuttle orbits is shown in Fig. 1-4. As transportation costs decrease and the number of active payloads increases, new methods will be needed to reduce the cost of attitude determination and control. At present, the most likely procedures to achieve this are (1) increased autonomy with up to 3 days of automatic control without ground support; (2) decreased hardware redundancy, since recoverable payloads will shift cost effectiveness; and (3) standardization of attitude hardware and, possibly, supporting software. Procedures for handling the increased data volume from the greater number of spacecraft will also be important. The development of routine processing procedures which, unlike most present systems, do not require operator intervention, will probably be required. The increased use of processing on board the spacecraft will not substantially affect the analysis described in this volume, since the analytic techniques do not generally depend on the physical location of the processor. However, elimination of complex communication links will eliminate a major source of data irregularities. In addition, the more limited size of onboard computers will place greater emphasis on reducing storage and computational requirements for attitude analysis. This suggests a possible dichotomy of functions in which sophisticated ground-based software will carry out inflight calibration and bias determination and send the resulting critical parameters back to the spacecraft for onboard processing of normal operating data. The Global Positioning System, also known as NA VSTAR, will use a network of 24 satellites for terrestrial, missile, and satellite navigation. Each GPS satellite will broadcast its ephemeris and the time, which will allow a GPS receiver to determine its own position from simultaneous observations of any four GPS satellites. The objective of the system is to provide all users with a positional accuracy of 20 m (either on the ground or in space), a velocity accuracy of 0.06 m/s, and a time accurate to 10 ns. Users with appropriate decoding equipment can obtain twice the accuracy in position and velocity. Finally, the Tracking and Data Relay Satellite System, by which operational satellites will communicate with the ground via geostationary satellites, has the potential for providing increased data Coverage over that presently available. (See Section 8.1 for a more detailed discussion of TDRSS.) However, the use of TDRSS will require attitude prediction several days in advance to schedule intersatellite communications. The implications for attitude research and development of these potential changes in future mission profiles are discussed in more detail in Chapter 22. The goal of attitude determination is to determine the orientation of the spacecraft relative to either an inertial reference frame or some specific object of interest, such as the Earth. To do this, we must have available one or more reference vectors, i.e., unit vectors in known directions relative to the spacecraft. (Recall that for attitude determination we are interested only in the orientation of the spacecraft and not its position; therefore, the magnitude of the reference vector is of no interest except as a possible check on our calculation.) Commonly used reference vectors are the Earth's magnetic field, and unit vectors in the direction of the. Sun, a known star, or the center of the Earth. Given a reference vector, an attitude sensor measures the orientation of that vector (or some function of the vector) in the frame of reference of the spacecraft. Having done this for two or more vectors, we may compute the orientation of the spacecraft relative to these vectors, with some possible ambiguity. To clarify this process, we will give two specific examples of attitude determination processes and one example of the use of reference vectors in attitude control. Although we will present only a single attitude determination method for each situation, most real spacecraft, such as the CTS example, have redundant sensors that can be used in various combinations in the case of sensor or electronic failure. In addition, although the examples are representative of several series of spacecraft, the actual hardware used, and the procedures by which it is used, are normally designed to meet the specific requirements of each individual mission and differ from mission to mission. However, individual missions within a series—such as the Synchronous Meteorological Satellite-1 and -2 or the Atmosphere Explorer-3, -4, and -5 spacecraft—will frequently have identical hardware.